You will exclusively enjoy the entire villa! 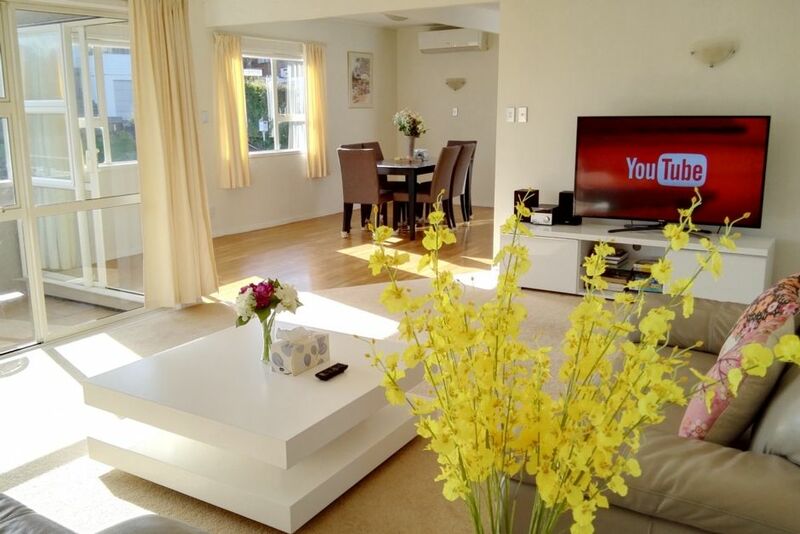 This holiday house is located on the Bucklands Peninsula, 2 minutes' walk to the beach and Howick Golf Course, with a lovely garden and balcony. Refurbished with the latest Appliances, new furniture and electronics. The home comes equipped with a Smart HDTV, Hi-Fi, air-conditioning, leather sofa, outdoor dinning table, trampoline, bay cot, washing machine and kitchen things etc. The master bedroom has an en suite bathroom. Just sit back to enjoy the Samsung HDTV, including youtube and lightbox, or turn on the SONY Hi-Fi to listen to local radios, Mp3 or CDs. Kis can play on the trampoline, or play puzzles. Or hanging out to the beach, or go golfing, fishing, or sailing is also a good option to get relaxed here. ?Guests can walk along the beach to cafes and restaurants. 100Mbps free fibre WIFI is included for you to get connected or catch up with friends. The property is 30-minutes drive away from Auckland airport with buses access directly to the CBD. Free private parking is available on-site. Guests can take the ferry to the Waiheke or Skycity, enjoying the fantastic harbor view! Close to Half Moon Bay, easy driving to the supermarket, yacht club, cafes and restaurants. Hi, I am Laura. Welcome to Auckland and I am really pleased to host you and your family. I enjoy the relaxed lifestyle of Auckland. Have a stay here, indulge yourself in this great scenery and enjoy the peaceful life, and more, get you and your family refreshed! With comfortable mattress and bed linens are changed for each group of guests. Really happy with our stay. The property was extremely clean, all linen and essential cooking items were provided which was wonderful as we were travelling from overseas. It was a great home for a large family and great for not only adults, but kids as well with complimentary Wi-Fi and games provided. Highly recommend this lovely property, I would defintiely stay again. The house had plenty of space and was very clean when we got there. Owner was very kind and organised any queries. Very comfy home and beautiful area. Spacious and bright house and in great location. Great location lovely house has everything thing we needed would definitely stay again!